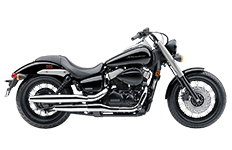 An aggressive yet stylishly perfected motorcycle, Honda's Shadow series Phantom 750 looks as tough parked as it does roaring down the highway. Accessorizing a Phantom takes more than just buying gear; It takes real know-how and experimentation. With such a beautiful bike, it's necessary to choose the right luggage to further enhance that clean image. We understand that owners and enthusiasts want only the best, so we've introduced the Viking Bags collection specifically cut for the Phantom 750. Check out each of the pages listed here for detailed specs of each saddlebag we offer.